Whether your industrial hose application is food processing or oil and gas distribution there is a wide variety of hoses and fittings to choose from. Each application has different hose requirements but when should you consider using a metal hose? When are they safer? Can it reduce company costs? Here, we explore the various factors to consider when choosing hose material for your industrial application. Would a hose failure be catastrophic in terms of down time or injury? Typically, metal hose fittings are welded compared to crimped or clamped in a traditional material hose. When failing, metal hose with welded fittings develop small holes or cracks as opposed to large cracks and blow outs, helping to minimize leaking product and cut disastrous events. Traditional hose walls are permeable materials and can seep gases. Expertly fabricated metal hose assemblies don't allow gases to pass through the hose wall. Because there's no cross contamination to the hose material, stainless steel hose can be cleaned with steam or compatible chemicals thereby extending service life and reducing costs. Metal hoses are rated for a wider range of abrasive and corrosive chemicals. All hose, fittings and any other assembly components are rated to withstand a chemical attack from both conveyed material and any external environmental chemicals. Metal hose assemblies can withstand high temperature media. If the temperature of the media conveyed is too hot or cold, not only will the service life of traditional material hose be shortened but the hose will fail. Keep your crew safe with metal hoses that remain flexible in low temp applications to –50 degrees. Metal hoses are not degraded by the sun or other radiating heat sources. Certain metal hoses are non-electrically conducive, will not spark and in the event of a fire, will maintain their integrity up to 1200F degrees. Stainless steel braiding prevents an abrasive external environment from creating failures. Higher vibration absorption than a non-metal hose also minimizes strain on connecting equipment. Nonmetallic hoses can collapse under vacuum even when reinforced. But, the corrugation in a braided metal hose help to retain its full shape under full vacuum. While metal hose is not recommended for high pressure applications, it is an excellent choice for vacuum applications. Whether you're the purchasing director or crew member, the responsibility of job safety is on your shoulders. Work efficiently and safely by carefully choosing your next industrial hose. Still not sure if a metal hose assembly is the right fit for your industrial application? Let GT make it EZ. Call our industrial hose experts at 800-966-1393 to help you determine the best industrial hose and fittings for the job or request a quote here. Our world is about products for your world. Products that let you do your job. From people that have the products for every job. On spec. On time. Every time. 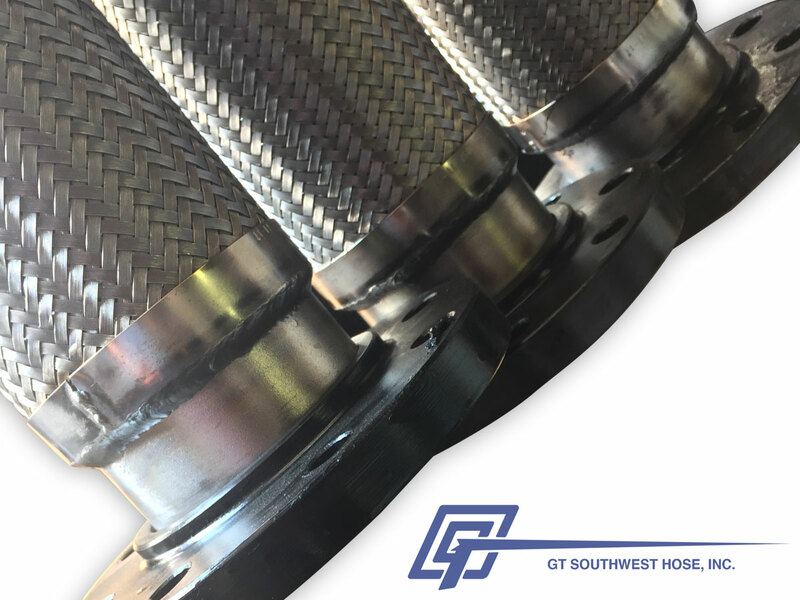 We're proud to be a leading custom fabricator of stainless steel metal hose in North Texas. Add our web site to your tool box. Or, give us a call. Let us show you how GT makes it EZ! Need help from a certified hose experts? Come in today and let our team of experienced experts provide you exactly what you need. Have questions? Call us! We’re open Monday - Friday 7:30AM - 5:00PM and Saturday from 8:00 AM - Noon. Have a complex application that needs custom metal hose fabrication? We engineer hoses for your specific needs, request a quote today. Looking for industrial hoses and accessories? We carry the top brands in the industry such as HoseMaster, Dixon, FlexFab, and more.